In 2011, Governor Andrew M. Cuomo established 10 Regional Councils and charged them with developing long-term strategic plans for economic growth in their regions. 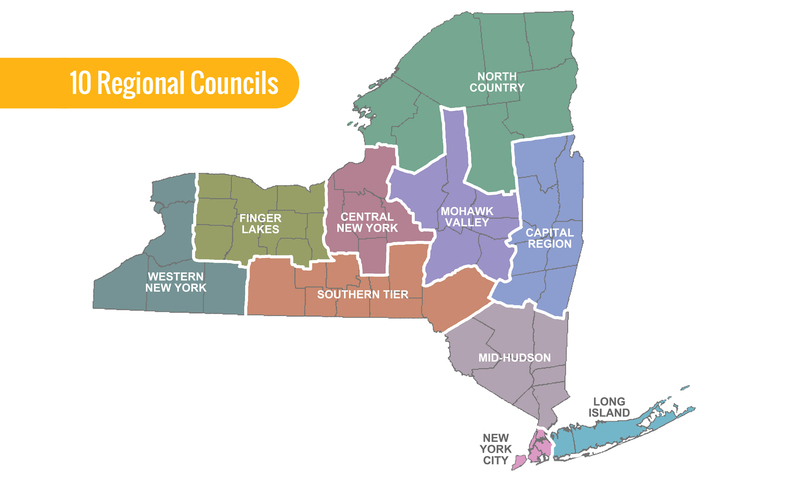 The REDCs are another source of funding for arts and cultural organizations that may apply for competitive grants through New York State Council on the Arts or other state agencies including the Office of Parks, Recreation, and Historic Preservation, NYSERTA, and Empire State Development. Regional councils consist of local experts and stakeholders from business, academia, local government, and non-governmental agencies. Currently, the arts are represented on some, but not all, of the councils. In 2017, the REDC initiative distributed $225 million in performance grants and tax credits from Empire State Development, and over $525 million from over thirty other state agencies, including New York State Council for the Arts.